Melbourne’s quality Tile and Grout Cleaning Services at Competitive Prices. Call the leading professional tile cleaners in Melbourne for your home or business and commercial needs. Tile and Grout Cleaning brings your tiled area back to life, while removing hard to reach scum, dirt and grime. Commonly laid grout is porous and over time with everyday wear and tear and common spills, your tiled flooring can look worse for wear. Many customers who are placing their homes on the market have found a professional tile and grout clean to add enormous value to their home. Impressions are everything and giving your flooring a refreshed look, will make all the difference. Day Care Facilities – Restaurant and Food Court floors – Shopping Centre Bathrooms – Commercial kitchens – Office bathrooms and floors – All tiled flooring. The Wizard Tile and Grout cleaning process begins with a pre-cleaning solution applied manually over the tiled area, with concentrated application to the dirty grout. Our tile cleaning experts will then use our powerful tile cleaning tool to lift the dirt and grime leaving your tiled floors with a near new finish. Perfect finish tip: We advise customers to allow the cleaned tiled area to naturally and provide cleaning tips based upon your requirements. The grout between tiles can create a perfect breeding ground for potentially harmful diseases, especially in commonly used wet areas such as kitchens or bathrooms. Having these areas professionally cleaned provides a safer environment. 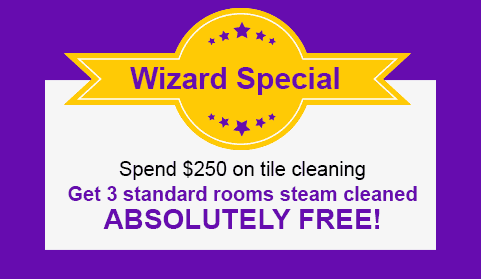 With a Wizard tile clean you ensure a hygienic, clean and safe environment for your customers and employees with our professional services. You will not only benefit from superior cleaning services, but also highly competitive prices. Upon arrival to your property, our tile cleaning specialists will assess your tile and grout needs and determine the amount of treatment application required. For extremely dirty and soiled grout we will apply a pre-treatment solution with active ingredients to loosen the dirt and remove stains more effectively. Q: Is mopping enough to clean floor tiles? A: Mopping helps in cleaning the tile and grout’s surface but it can’t get rid of dirt and germs that are deep in the grout. You should always use a clean mop because old and dirty mops cause discolouration in the grout. Soap scum may also accumulate on your floor tiles and this traps dirt under layers of soap. This not only makes your floor look dirty, but also makes it quite slippery! Another thing to consider is that mopping can push dirt back into the grout’s nooks and crannies, which can damage it over time. Q: Can bleach or acids be used in cleaning and disinfecting tiles and grout? A: Bleach is often used to whiten and clean tiled surfaces, but it is NOT recommended for tiles and grouts. Bleach makes the grout brittle, leaving them weak and prone to deterioration. It also ruins the shine of tiled surfaces. Acids in the meantime are too strong. They can damage the surface and cause the grout to erode. Any abrasive substance can cause more harm than good to your tiles and grout. Q: Are floor tiles easy to maintain? A: Compared to carpeted areas, yes, floor tiles are easier to maintain because it requires less maintenance. However, regular tile and grout cleaning from qualified professionals is important to remove deep seated germs and bacteria in the grout. Professional cleaning also increases the longevity of your floor tiles and other tiled surfaces. To learn more, read our article on how you can benefit from a professional tile and grout cleaning. Q: How often should the tiles be cleaned? A: As with carpet cleaning, foot traffic, children, pets, and routine floor maintenance need to be considered when determining the frequency of tile and grout cleaning. A professional tile and grout cleaning is recommended every 18-24 months for homes. Businesses or public facilities will require a professional tile clean every 6 months. Q: Should grout be sealed? A: Grout sealing is not a necessity, but if you choose to seal your grouts, choose a sealer that offers a lifetime guarantee. Otherwise, you risk the sealer flaking away over time which results in patchy looking tile areas. When this happens, the sealer will need to be removed and the tiles cleaned. This process can be costly for you as you may spend more than $25 per square metre while having a cleaning scheduled every few years will only cost $5 per square metre. Instead of sealing your grout, we recommend having your tiled areas cleaned regularly by a professional cleaning service like Wizard. Q: How do I know if the grout needs repair? A: As soon as you spot obvious cracks, it’s time to consider repairing it. Cracks in the grout can cause the tiles to come loose. It is best to get the grout repaired before further damage occurs to the tile surface. Q: How does grout re-colouring work? A: At Wizard, we do not recommend grout re-colouring as a solution to fixing a discoloured grout because it is simply masking the problem. To effectively remove stains from the grout, we recommend a professional tile and cleaning service.